Bakers have worked to capture the beauty of our favorite video games in cake form since the dawn of time. From amateur bakers to world famous chefs, video game cakes are a staple of any cook worth their weight in fondant. Now it's your time to get your hands sticky and create your own masterpiece. Kelli Watkins has a gift for cake design and offered to share her techniques with us. The following is a step by step walk through by Kelli on how she made her "Furious Fowl" cake for the Threadcakes cake competition. Threadcakes is a competition put on by Threadless T-shirts to turn their shirt desings into delicious baked goods. In Kelli's case, it was the Angry Birds inspired Furious Fowl. 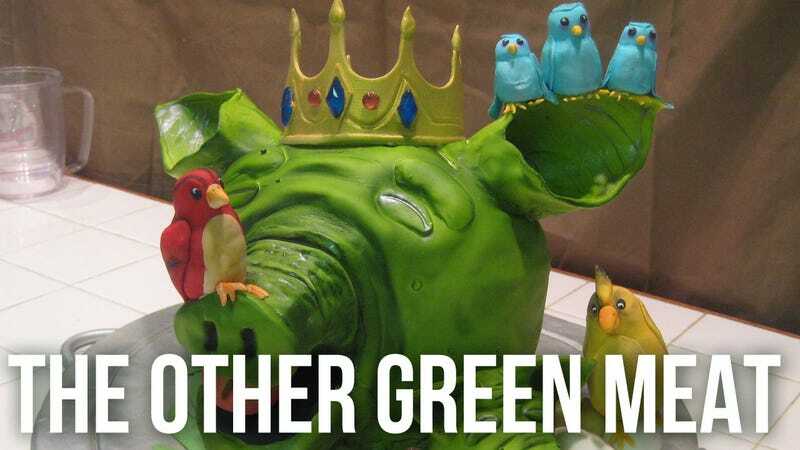 Click through the photos in the gallery to see each step and learn how to create your own Angry Birds cake then take the techniques and make a cake for your favorite game. Don't forget to check out Kelli's TWO entries in the Threadcakes contest and vote on your favorite. Making pig's head out of cake isn't impossible. Here's what you will need to get started. If you don't have all of the items, be creative and improvise! A few days before you want to make the cake, you will need to make the crown and the pig ears so the fondant will have time to dry and harden. If you don't have an airbrush you might want to dye the fondant as you make it before you assemble certain pieces of the cake for the best results. Roll out a piece of fondant about 1/8" to ¼" thick and trim into a rectangle, keeping in mind the size you would like for your crown. Using an Xacto knife or other similar tool, make several U-shaped cuts on one of the long edges of the rectangle to create the points of the crown. Use cake crafting tools or whatever you can find to make the decorative indentation. The end of a small paint brush works well for this. When you are happy with your design, carefully lay the fondant onto a piece of waxed paper. Now, find something, anything, in your kitchen that you can wrap the fondant around to give the crown a round shape. I used a can of whey protein, about 4" wide. Tape the waxed paper to the object and let the crown dry. Once dry, airbrush or brush with gold sheen food coloring. Affix the jewels with piping gel. Tip: If you can't find gold sheen food coloring, just use yellow. Close enough! Tip: Use a fondant/gumpaste mixture to decrease the drying time. To make the ears, roll out a piece of fondant about 1/8" to ¼" thick and cut out two triangles, keeping in mind the size you would like for your pig's ears. Use a cake tool to make indentations in the fondant to resemble wrinkles in the inside of the pig's ear. Curve the bottom points of the triangle in so they are touching and create somewhat of a cone shape. You may need to trim off some of the fondant to get the shape you want. Once you are happy with the shape, slip the ear onto something cone-shaped to dry. I made cones out of a cereal box and covered them with waxed paper. Tip: Try making a pattern out of paper to get the proportions you want prior to cutting your fondant. Tip: If you are not using an airbrush, be sure to color your fondant beforehand. Pre-made sugar jewels are available online but it is always more fun to make them yourself. If you do, you will need isomalt crystals and a silicone jewel mold. Using the medium-high setting, heat 1 cup of isomalt crystals and 1/3 cup of distilled water in a saucepan. Whisk until dissolved. Use a pastry brush and water to wash down the sides of the pan to prevent crystallization. Once the temperature reaches 280, you can add the food coloring. Start with one drop then add as needed. When the temperature reaches 315, remove from heat and fill your mold. The sugar will be VERY hot, be careful! After 30 minutes you can remove your jewels from the mold. Tip: Use Cake Play isomalt sticks. They come in several colors and you can warm them up in the microwave. Tip: If you don't want to mess with isomalt, see what candy you can find at the supermarket. I am sure you could find something that would work. The platter is easy. Dab some piping gel on your foil covered cake board. Roll out some fondant so it covers the cake board and trim off the excess. Use a cake tool to give it some detail. Use the extra fondant and roll into a "worm" to make the handles. Attach the handles to the platter with piping gel. Airbrush with silver sheen food coloring or brush it on. Or just use your mom's silver platter and forget about the cake board and fondant all together. Stack your cake layers. The tricky part here is that you have to carve the cake but you still need support so it doesn't fall over. Keep this in mind when cutting your cake boards that go in between each layer. Begin carving!! I started with the jaw and worked my way back. Make sure you carve out the facial details as well, such as the eye sockets. Keep a picture of the pig next to you when carving to use for reference. You can see one of the cake boards in this shot. Once you are happy with the shape of your piggy's head, frost with buttercream. Roll out a large piece of fondant about ¼" thick. Cover the pig's head. It is ok if the snout isn't covered. This can be added later. Add wrinkles by gathering the fondant with your fingers. Cut pieces to cover his snout if you didn't get it on the first go. Cut a round piece of fondant and use a cake tool to create his nostrils. Use piping gel to affix the nose to the pig's snout. The small pig head is made out of rice cereal treats. Just squash a bunch of them together and mold it until you get the basic shape. Don't worry about the ears. Those are made of fondant. Cover the head with fondant and use a cake tool to create the wrinkles. Roll out a piece of fondant about ½" thick and cut out two triangles. Use your hands to form the ears of the pig's head and put them on the head with piping gell. As you did with the larger head, create the nose and attach. Cut two small ovals for the eye lids and use the cake tool to detail. Roll tiny bits of fondant in the palm of your hand to create warts and attach with piping gel. Use an Xacto or knife to cut his jaw open so you can add the apple. And now the ears. Position the pig's ears and VERY carefully push the ears into the cake to help with stability. Add a piece of fondant around the bottom to help soften the edge. Add the warts and the eyelids and add any other details you think the pig needs. Airbrush the pig's head as you see fit. If you don't have an airbrush it is easier to color the fondant before you roll it out rather than trying to brush the entire cake due to size. Place the head on the platter. Once I had the shape of my cake, I cut the bottom cake board down so it was easier to hide. Add a piece of black fondant to the bottom jaw to represent the inside of his mouth. Place the small head on the platter. Fasten the crown to the pig's head with piping gel. Use a ball of fondant to mold the small apple. Poke a hole in the top and roll a tiny "worm" out of fondant for the stem. It's probably easier to make the larger apple out of rice cereal treats and then cover with fondant, but you can use a giant ball of fondant as well. Once you have shaped the apples, use petal dust to color. Tip: If you don't have petal dust, just color your fondant or brush on food coloring. Tip: Make sure not to make the apples too big. They need to fit in the pig's mouth without breaking its jaw. Take some fondant and roll into a big worm for the slingshot. Make one end of the worm thicker so you can make a cut to form the "Y". Use a cake tool to add detail and color if needed. Roll out some green fondant about ¼" thick and cut several leaves. Use the leaf veiner to add detail (or use the cake tool if you don't have a veiner). Stick the apples into the piggies' mouths and add the leafs at the base to cover the cake board. Add the slingshot to the platter. Roll some worms out of red fondant and add to the slingshot. Take some light brown/tan colored fondant and make the sling part of the sling shot. Don't forget to make the pellets for the slingshot too! Use a small amount of rice cereal treats to create an egg shape with a flat bottom. Remember, these birds will be sitting on the pig's ear so be sure they are small enough so all three can fit. Cover each with blue fondant. Cut out wings, crown and a tail and attach with piping gel. Roll tiny ball of black fondant to make the eyes and a cone of yellow fondant to make the beak. Also use the yellow to make the feet. Just use three small worms to make each foot. Create the larger birds the same way you did the bluebirds. Use cake tools to add texture to the wings and use a dark petal dust for detail. Don't forget to shape some eggs out of fondant and add them to the platter. Use piping gel to keep the birds in their place. All done! Time to cut the cake and celebrate! Click on to see some close ups of the finished product. There you have it Caketaku! Special thanks to Kelli Watkins for her step-by-step walk through on how she made her "Furious Fowl" cake! If you ever attempt an Angry Birds cake or any other video game related cake after reading this guide make sure to send us some pictures! You can contact Sam Winstrom, the author of this post, at Sam@kotaku.com. You can also find him on Twitter and lurking around our #tips page.